Even during the days of negotiations, our own experience taught us that the pursuit of human fraternity and equality - irrespective of race or religion - should stand at the centre of our peaceful endeavours. The choice is not between freedom and justice, on the one hand, and their opposite, on the other. Peace and prosperity; tranquility and security are only possible if these are enjoyed by all without discrimination. We are proud as humanists, that the international consensus on the need for the implementation of the Oslo Agreements is finding expression in the efforts of the multitude of Israeli and Palestinian citizens of goodwill who are marching together, campaigning together, for an end to prevarication. These soldiers of peace are indeed sending a message to us all, that the day is not far off, when Palestinian and Jewish children will enjoy the gay abandon of children of God in a peaceful and prosperous region. But we know, Mr. Chairman, that all of us need to do much much more to ensure that this noble ideal is realised. 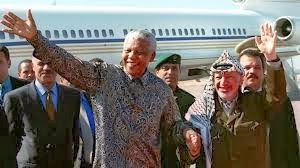 As early as February 1995, our government formalised its relations with the State of Palestine when we established full diplomatic relations. We are proud of the modest technical assistance that our government is offering Palestine in such areas as Disaster Management, women`s empowerment and assistance to handicapped children. But the various discussions with our counterparts in Palestine are an indication that we can do more. We need to do more as government, as the ANC and other parties, as South Africans of all religious and political persuasions to spur on the peace process. All of us should be as vocal in condemning violence and the violation of human rights in this part of the world as we do with regard to other areas. We need to send a strong message to all concerned that an attempt by anyone to isolate partners in negotiations from their own mass base; and attempt to co-opt tes is bound to hurt the peace process as a whole.